Two new British records have been set by two Welsh sheep shearers. 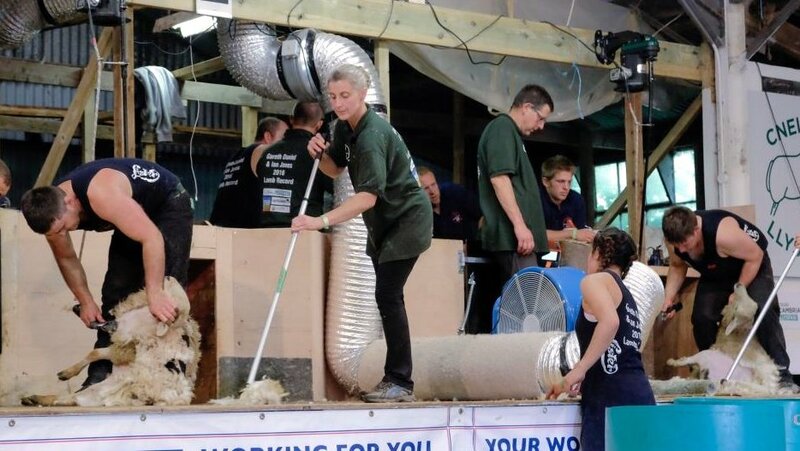 Shearers Gareth Daniel and Ian Jones established the Nine Hour Two Stand British Lamb Shearing Record at Ruthin in North Wales by shearing a combined total of 1,457 lambs – a feat that has never before been attempted in the UK. Gareth also set a new Nine Hour British Lamb Shearing Record with his tally of 781 lambs --beating the previous tally of 537. Gareth, aged 33 and from Penegoes, near Machynlleth, took up shearing aged 19 as “a means of getting to New Zealand”. Today, he is a beef and sheep farmer and contract shearer. His shearing partner, fellow farmer 36-year-old Ian Jones, is from Hundred House, near Builth Wells. He manages a flock of predominantly Beulah Speckled Face sheep and finishes store calves. “We owe our success to the many helpers from across the industry who brought the lambs forward, packed the wool and provided help and support in the build up to the day. Setting a record like this is a real team effort,” said Gareth. The last three weeks shearing in the UK has also seen Matt Smith and Ivan Scott breaking World Records with Gareth and Ian setting this new British record. Support for the record breaking attempts was provided by the British Wool Marketing Board. Chairman, Ian Buchanan, said: “Competitions help take us to the next level, transmitting enthusiasm to the next generation.